Three-quarter length portrait of Lord Lister seated in a green leather and wooden armchair with scrolled arms, dressed in a black suit and bow tie with a white shirt. Four upright leather-bound volumes are visible on a desk behind. Lister is posed half-turned to the viewer’s left, with legs crossed, his right elbow leaning against the chair with this hand to his face, index finger on the cheek. 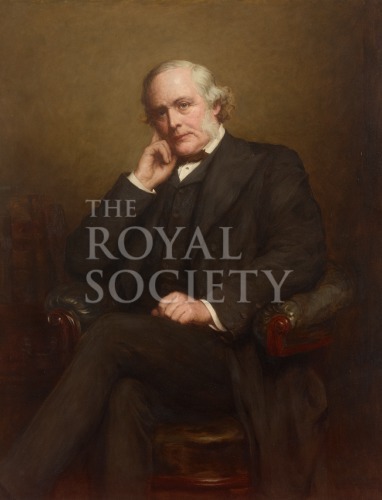 Joseph Lister was elected a Fellow of the Royal Society in 1860, he served as its President from 1895 to 1900. Commissioned by the Royal Society, 1927. The commissioning followed immediately on the death of Lord Lister and is recorded in Council Minutes: “The Officers reported that there was no portrait of Lord Lister in the possession of the Royal Society, and that they had consequently commissioned Mr.Dorofield Hardy to make a copy of the portrait by Ouless of Lord Lister in the possession of the Royal College of Surgeons. Resolved – That the action of the Officers be approved and that the sum of £75 be voted from the Donation Fund in payment of the artist’s fees “ [Royal Society Council Minutes, Printed, CMP/13, 1926-1932, meeting of 10 February 1927, p.14].